The shadowy order known as the Tal-Ifatiir is on a quest to destroy the demon lord, Aghal-Paraag. So, their leader, the Immortal Ralaan ad-Zaliir, sends them into an unknown land to capture the demon lord's servant: a powerful witch with nefarious goals of her own.However, Chadhiyana, the order’s first female member, holds a horrible secret from her past and is plagued by troubles she's afraid to reveal. As the company journeys to Aghal-Paraag’s prison, one misfortune after another befalls them. What can be the source of their troubles? The witch? The demon lord himself? Perhaps it is Chadhiyana or the secret she has sealed behind her closed lips. J. M. DeSantis is a writer and artist of fantasy, horror, and humor. He is best known as the creator of the fantasy heroine, Chadhiyana, though his short stories and artwork have appeared under many publishers including Heavy Metal Magazine, Static Movement, Innsmouth Free Press, and Atlas Unleashed. Notably, he was the cover artist for The Book of Charlie: Spirit of the Pompey Hollow Book Club (Little York Books) and wrote the short story, Diwali, for Steampunk Originals: Volume 1 (Arcana).J. 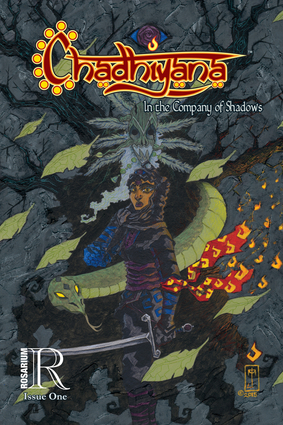 M.’s first graphic novel, Chadhiyana: In the Company of Shadows, began as a web-comic (on chadhiyana.com) in 2013. J. M. is currently working on a number of other projects, including his weekly blog on his website, jmdesantis.com, where one can also keep abreast of his latest work and projects. J. M. DeSantis is a writer and artist of fantasy, horror, and humor. He is best known as the creator of the fantasy heroine, Chadhiyana, though his short stories and artwork have appeared under many publishers including Heavy Metal Magazine, Static Movement, Innsmouth Free Press, and Atlas Unleashed. Notably, he was the cover artist for The Book of Charlie: Spirit of the Pompey Hollow Book Club (Little York Books) and wrote the short story, Diwali, for Steampunk Originals: Volume 1 (Arcana).J. M.’s first graphic novel, Chadhiyana: In the Company of Shadows, began as a web-comic (on chadhiyana.com) in 2013. J. M. is currently working on a number of other projects, including his weekly blog on his website, jmdesantis.com, where one can also keep abreast of his latest work and projects.